MY awesome players bought me the DMG! Wooooo! This looks like a fun read. I love all the world building stuff in the book. Back to the session, I almost had a few TPK's but thankfully a few quick thinking ideas by the players, specifically the rogue managed to turn the tide. The game is deadlier that I first thought. When reading the rules for the first time I was thinking damn these PC's are going to be tough! But a few instances, I almost killed them in one roll. Actually that first goblin encounter was almost deadly, pack it up go home hahaha. One funny bit was that the PC's split that party. The other two went to investigate the Rebrands at the Sleeping Giant tavern. As one of the players was a thief, and had previously been a fence in neverwinter. He figured he might be able to gather some information on the bridgands. Well the encounter happened and they pissed em off. A fight ensued and both PC's started to high tail it back to where the other PC's were. One got hit with a flying sword and fell unconscious making saving throws, prior to that however he managed to break thru not one but two windows of local farm houses. (thank you DMG chase rules). Unfortunately it was raining pretty good out there yesterday so we were not able to play on the deck as I had previously hoped for. Considering we only really get like 3 months of summer. My friend Adam, brought his charcoal smoker and managed to make what is called a "bacon explosion" its bacon wrapped sausage with bacon on the inside and bbq sauce. basically yum! 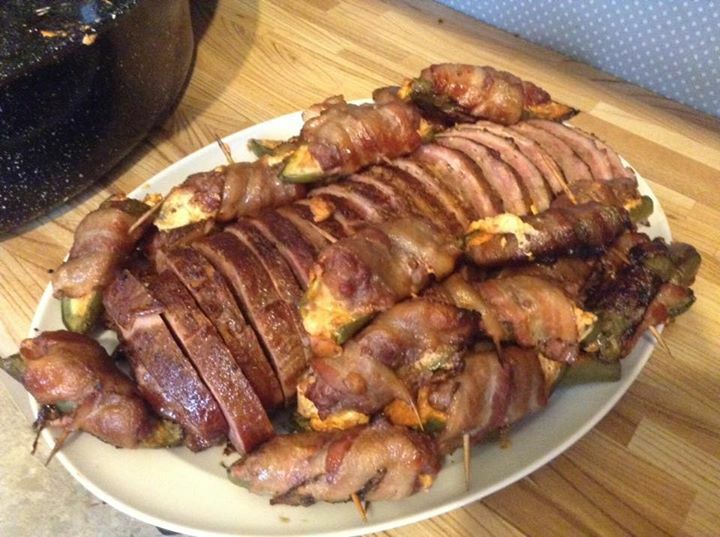 He also made ABT's which are jalapeno's stuffed with cream cheese and sausage super good! Here are the pics, before and after. 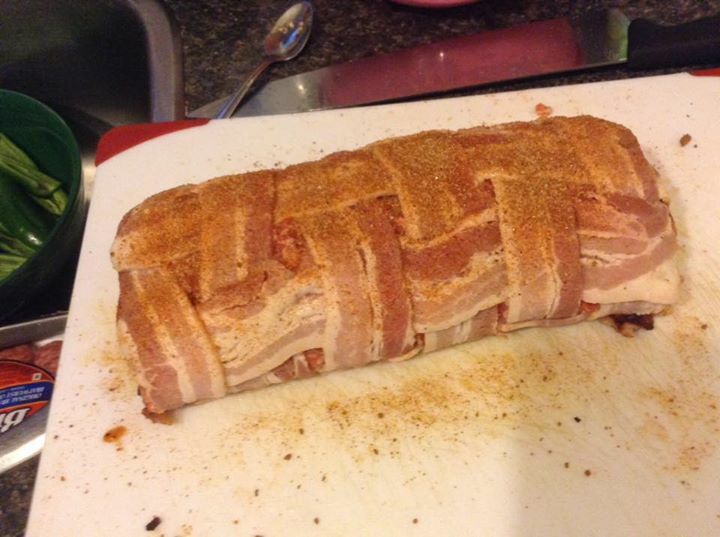 Is a bacon explosion the aftermath of an Eldritch Blast?